Good morning Saturday! Blue sky and billowy trees and (as yet) no rain. Although I quite liked rain last weekend, (sorry Jubillee-ers) because it meant I didn’t have to cut the hedge :) It’s 200 feet of rampant, scratchy green stuff that not only needs cut but cleared and bagged up and, I’m sorry, that’s nearly as bad as recurring villain ‘ironing’. And because it looks like it’ll be bright, I’ll have no excuses today. Still, it would be way too rude to get out the noisy machine at the moment (7am) so I will contemplate nature’s changes before I drift out with a cup of coffee and see what’s occurring. That’s what, as a new new ‘gardener’ I’m kind of getting to like: in the five days of Welsh wind and torrential rain, the garden will have changed without me having set foot in it. Last weekend my first ever carnation opened in the new raised beds. And I know it’s survived this week as I can see it from the living room window. Looks a tad lonely, but hopefully some friends are due to arrive fairly soon. When I took the picture I didn’t realise first friend would be the Olympic slug! I put plenty in, I just don’t have any idea what the full bloom effect will look like. Well, I sort of do… There will be pink carnations sitting beside multi-coloured lupins (which will always make me smile because my Mum had them in the gravely bit between her and next door and I did a project about them in school). There are some other things planted at equal space on the other side with quite big velvety leaves but I can’t remember what they are. I know they are not hostas because I’m steering clear of them after one of them decided to eat my front garden. If my kids had grown that quickly they’d have been in the Guinness Book of World Records. I’m afraid I don’t like plants that are so confident they dominate your garden in a couple of seasons but I suppose once I get to grips with what plants are what (!) and how I’m supposed to tame them, I might change my mind. Anyway, the mixed arrangement next to the carnation plant is likely to be a splendid multi coloured surprise given my inability to retain things like plant names, but still, much better than the riot of weeds, brambles and horrible things that were there last year. It is going to look mega fab when the gravel goes down there. Hopefully this weekend or next depending on whether I eat my Weetabix, and get myself down to order the stuff. I’ve got an aerial pre gravel picture so you can see what you think when I get it done. My garden renovation is coming along well. The only dilemma is ‘Rhu’. The garden was sparkly splendid after lots of rain. Clearly I hadn’t knocked enough holes in some of the planters and I had to de-waterlog the one with honeysuckle in. Everything else looks charmingly healthy, bursting with enthusiasm after the right royal rain. Indeed the hedge, who will not be given an affectionate name because I still begrudge the achy hours of cutting it, looks perkier than ever and perfectly pleased at growing so quickly in such a short time. Grrr. And Rhu was today’s big smile: I moved Rhu in the great liberation of the far back in the first sunshine of this spring. Rhu was not too charmed as she was already producing chunky stems of fruit, but no, she couldn’t stay so she got uprooted to a new home approximately six feet away. At first she looked ok but then had a major wilt and I was quite worried about her. Thankfully though, she has enjoyed the weather and there are eight or nine shoots that weren’t there last week. Lucky she delivered actually, because the six foot move wasn’t properly thought out and I did consider further relocation. New shoots, she wins, no hard feelings. I’m sorry– I didn’t cut the hedge. It rained again. And I this is all so much fun … Jasmine, the newest addition to the newly emerging garden has obviously been planted in exactly the right place… two plants, one either side of the best branch wigwam in the west. Made by my niece and nephew from the rudest, hardest to cut, balance on whatever you can balance on to reach the branch, branch (and hedges shouldn’t even have branches, should they?) The wigwam was built by the three of us in the last light of a Saturday afternoon. It seemed like a properly aunt-y thing to do, especially as they never know what to expect with me (which means they are rarely disappointed). I wanted to keep the wigwam because, for me, it’s a kind of spontaneous art feature. It’s the little things sometimes, isn’t it? I’ve been so pleased with progress so far in renovating my garden and sifting through all the ideas that keep drifting into my head, that I sometimes forget that it is the maintenance things that give the full effect. So I cut the grass! It’s getting easier now because the garden’s divided and some of it is barked and gravelled, so the whole task is much more manageable. It helps too when the strimmer behaves, which following the usual groan and burp noises that signify ‘the nylon broke’, strimmer and I settled down to re-nyloning the spindle. The little raised arrows gave me a clue and I’m happy to report that no more unpleasant noises were emitted. But with the sun out you just can’t keep ignoring stuff, can you? Ironing, car washing, more ironing and cleaning the oven just don’t even scratch the surface compared to washing the fascias out the back. Suffice to say I did not iron, wash the car or clean the oven, I treated myself to a sponge wash up a step ladder to make the plastic trim shine again. I am just such an exciting person. It worked though, the garden needs a back drop that doesn’t irritate you when you sit down after doing your jobs or when you are just admiring nature’s work. After laying our new patio at the bottom of the garden last year we have decided that the bottom of the garden looks very dark a compared to the Christmas grotto at the top. To address this, we have invested in some new solar post lights. After all, they’re in a shadier part of the garden so they shouldn’t make our garden look like a landing strip and we have the ideal place for them. Just at the edge of the border in the patch we have named ‘Pooh Corner’ for reasons that I won’t go into — suffice to say that we have five cats. After all, who wouldn’t want lights there? Having deliberated over the merits of solar versus wired, we decided to take the lazy option. However, if we want to install a water feature there (it really is the only possible place in our garden, although yes I do have concerns about its possible use as a cat bidet), then we will have to install electricity at some point. For now however, we have plumped for ease. Never one for patience, I am struggling to wait until the weekend to install them. They are on a spike, wire-free and the solar panel is concealed in the top of each light. Perfect! It turns out to be a quick and easy job. The spikes slide easily into our clay that is still damp from the torrential rain and I can’t wait until it gets dark. The cats seem to like them too although there is very little for them to damage, unlike my fairy lights which one of the furry five decided to snack on one morning. As the sun sets, I’m bitterly disappointed. They haven’t been out long enough to charge up, my husband informs me. (Once an engineer, always an engineer). Day two dawns bright and sunny. I have high hopes and I’m not disappointed. Seen from space? Our garden at night? Well, I never! barrels, although we’ve also got some in a couple of hanging baskets. Fingers crossed they’ll be a success, we’ll let you know! Of course, gardens are more than just a place to grow things, they’re also places to sit down, relax and enjoy the beauty around us. At this time of year, one of the best ways to enhance your garden’s natural charm is by taking advantage of solar power. Many garden features and decorations can be powered by the sun and this has a lot of knock-on benefits, for example lower costs as solar energy is free unlike electricity. Solar products can also be placed anywhere outside (as long as the panel is in the sun) whereas mains powered products need to be placed near the house to be connected to the electricity. 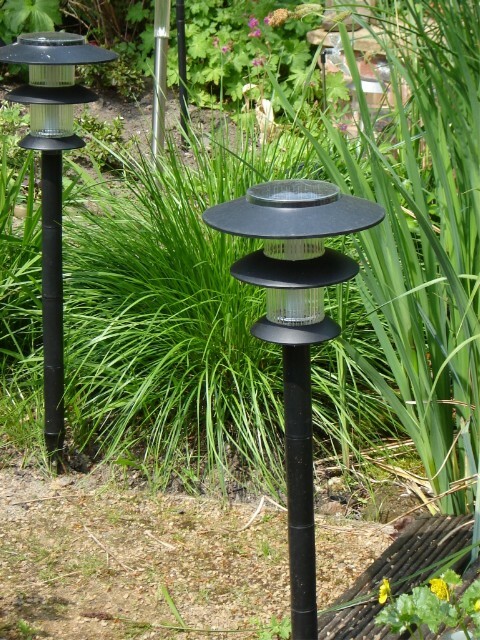 Solar lights are one of the most attractive and varied solar garden products available. Some, like the colourful butterflies in the picture, are very pretty and unusual, but if you prefer something a little less extravagant, this set of four lamps is classy and also ideal for lighting up a path or patio area. From table lights to light strings with 50 LEDS, there is such variety available that there will be something for anyone’s taste. features come with a solar option, but if you already have a water feature that runs off the mains, you can still save some money (and the environment!) by turning it solar with a solar pump kit. In addition to decorative items, energy from the sun can also be used to run more practical items. An outdoor clock is perfect when you need to keep an eye on how much time you’ve spent in the garden, but solar clocks that absorb the sun’s rays can often provide an extra power supply for LEDs on the clock, so it can still be used on balmy nights when the sun has gone down. Even pest control devices which chase away those pesky cats or moles can be powered entirely by solar energy! So versatile, so eco-friendly, so cost-effective – have you tried solar yet?